"Moon and Me" is a classic series of 50 gentle stories for preschool. It is designed to promote core values through an appealing narrative of warmth and security. The series, from "Teletubbies" creator, portrays a tightly bonded "family" of comical toy characters living in a Toy House and the adventures they all share with a magical visitor from the moon. "Moon and Me" stories play out with overt and emphatic expressions of kindness, empathy, generosity, respect, inclusivity and consideration, all while breaking new ground in its conceptual ambition. A fun new comedy featuring the Characters Cooper and Poppy - finding their way in the big wide world, dealing with new experiences, facing fears, making friends and having great outdoor adventures. Director - 26 x 11' Live Action Comedy for 5-8 year olds. Worldwide distribution. Adult comedy show with scripted chat, drive-bys, and sketches, which followed the premise of a semi-educational show. Featuring among many, Richard Shiff, Beverly D’Angelo and Mark Hamill. Comedy drama of spooky tales and urban myths as told by Podge and Rodge, and performed by Ballydung players. Including chart topping Christmas sell thru videos. Over 100 episodes of multi-award winning scripted chat show. 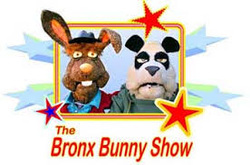 An adult puppet show where Bronx Bunny and his cigarette-smoking sidekick panda Teddy T, interviewed celebrities who "done good". Also featured pseudo-educational items, such as 'The Internal Gerbil', numbers illustrated by pole dancing and one track mind Spanish phrases! The Once a Week Show with Dustin and Sinéad from Sinéad's House Where Dustin Likes to Hang, a comedy chat show hosted by Sinéad Ni Churnain and Dustin the Turkey of Eurovision fame!